Offering you a complete choice of products which include bain marie display counter, bain marie table top, cold display counter, bakery display counter, cake display counter and sweet display counter. 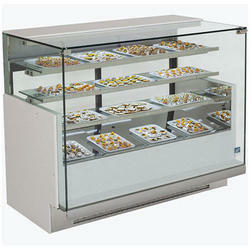 We are offering Bain Marie Display Counter to our clients. 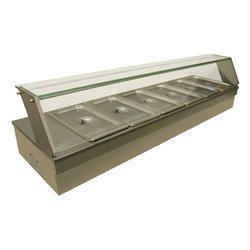 Hot Bain Marie Counter offered for food courts, Canteens & restaurants. We are offering Bain Marie Table Top to our clients. 1) Bainmarie top made in heavy duty 16 gauge stainless steel material. 2) Bainmarie side covering made in heavy duty 20 gauge stainless steel material. 3) Bainmarie Legs made in heavy duty 16 gauge stainless steel material. 4) Bainmarie frame work made in 32mmx32mmx3mm mild steel. 5) Bainmarie comes with height adjustable nylon bullet feet for better staibility. 6) Drain with garden hose connector for ease of cleaning. 3) Hot Bainmarie Body is Double Jacketed insulated with mineral glass wool. 8) Energy saving Heater installed with high speed heating and automatic switch off when temperature reaches with power saving technology. 9) Bainmarie bottom shelves made in heavy duty 20 gauge stainless steel material. 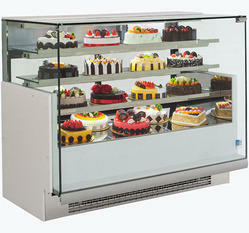 We are offering Cold Display Counter to our client. 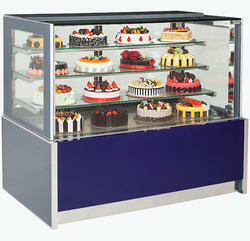 Table & Counter Top Cold Display Counter For Sweet Manufacturer, Supplier & Exporter in Delhi, India. 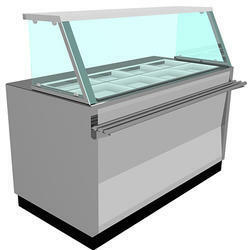 We are offering for our valued clients quality approved Cold Display Counter that is ideal for display all variety of cakes, pastries, sandwiches, chocolates etc. These are manufactured in accordance with the set industry standards. Offered range can be accessed in varied sizes for applications in different industries. In order to meet exact needs of our clients, these can be customized in various specifications. • Doors: Rear sliding glass door with mirror film to enhance product visibility. 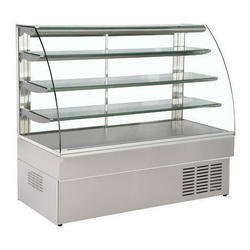 • Refrigerated unit: Reliable, self-contained system, designed to be installed on top of the counter. • Refrigerated model has condensing unit extended under the counter to maximize product display space. • Fitted with condensate evaporator, no drain connection required. CFC free R134a refrigerant. Packaging Details: shrink wrap packing. 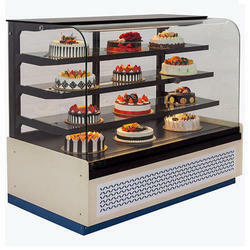 We are offering Bakery Display Counter to our clients. • Glass: Double glazed reflective glass panels side and front with front panel heated. Akreeti Industries is a prominent Exporter, Manufacturer, and Supplier of a qualitative range of Cake Display Counter & Bakery Equipment. Our product range encompasses Cake Display Counter, Bakery Equipment, Kitchen Equipment, Display Counters, Hood Type Dishwasher, Kulfi Machine, Revolving Cold Display Cabinet, Indian Range, Deep Fryer, Sandwich Griller, Mixer Conveyor Dishwasher, and others. Established in the year 2015, we are an internationally recognized Commercial Kitchen Equipment manufacturer that serves the best quality Cake Display Counter products in terms of technology, performance, and efficiency. We feature high quality items and our trained sales consultants helps you in placing bulk order assuring competitive pricing and on time delivery. We are equipped with robust infrastructure that help us manufacture and develop high quality Cake Display Counter & Bakery Equipment in compliance with the market standards. Our products are made using durable and robust component that improved the functional efficiency of the Commercial Kitchen Equipment. Our infrastructure facilities includes manufacturing, quality testint, warehouse, and sales & distribution Channel. These Channel are handled by professionals having extensive experience and expertise in provide end-to-end solutions to the customers at competitive price. Size 48" x 27" x 48"
Thickness Interiors in 22Swg SS 304 Grade & Exterior in 19Swg SS 204 Grade. We are offering Sweet Display Counter to our clients. Akreeti Industries is a prominent Exporter, Manufacturer, and Supplier of a qualitative range of Bakery Display Counter & Bakery Equipment. Our product range encompasses Bakery Display Counter, Bakery Equipment, Kitchen Equipment, Display Counters, Hood Type Dishwasher, Kulfi Machine, Revolving Cold Display Cabinet, Indian Range, Deep Fryer, Sandwich Griller, Mixer Conveyor Dishwasher, and others. Established in the year 2015, we are an internationally recognized Commercial Kitchen Equipment manufacturer that serves the best quality Bakery Display Counter products in terms of technology, performance, and efficiency. We feature high quality items and our trained sales consultants helps you in placing bulk order assuring competitive pricing and on time delivery. We are equipped with robust infrastructure that help us manufacture and develop high quality Bakery Display Counter & Bakery Equipment in compliance with the market standards. Our products are made using durable and robust component that improved the functional efficiency of the Commercial Kitchen Equipment. Our infrastructure facilities includes manufacturing, quality testint, warehouse, and sales & distribution Channel. These Channel are handled by professionals having extensive experience and expertise in provide end-to-end solutions to the customers at competitive price.